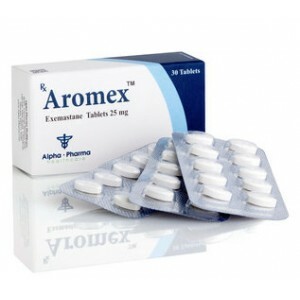 Aromex is an irreversible steroid aromatase inhibitor; its structure is similar to the natural substance Androstenedione. In postmenopausal women, estrogens are produced primarily by the conversion of androgens to estrogens by the action of the aromatase enzyme in peripheral tissues. Blocking the formation of estrogen by inhibiting aromatase is an effective and selective treatment for hormone-dependent breast cancer in postmenopausal women. In postmenopausal women, exemestane, starting with a dose of 5 mg, significantly reduces the concentration of estrogen in blood serum; maximum reduction (> 90%) is achieved with a dose of 10-25 mg. In postmenopausal patients with a diagnosis of breast cancer who received 25 mg of the drug daily, the total aromatase level was reduced by 98%. Aromex has no progestogenic and estrogenic activity. A small androgenic activity, probably associated with the 17-hydrodata, was observed mainly when using the drug in high doses. In studies of long-term daily use, exemestane did not affect the biosynthesis of hormones such as cortisol or aldosterone, whose levels changed before or after the ACTH test; This has demonstrated selectivity for other enzymes involved in hormonal metabolism. In this regard, there is no need for substitution treatment of SCS and mineralocorticoids. A slight increase in serum LH and FSH levels is observed even at low doses; this effect, however, is expected for drugs of this pharmacological group; it probably develops on the basis of feedback at the level of the pituitary gland: a decrease in the concentration of estrogen stimulates the secretion of pituitary gonadotropins (also in postmenopausal women).